The Pars showed great character today to get a very good workmanlike 2-0 win at Firhill after the disappointment of defeat at Ibrox during the week. It is always something of a lottery for managers and coaches when their team has played a big game midweek. How will the players react in the next match? Well, Jim McIntyre got the answer he was looking for at Firhill today with his side putting in a good shift against what must be said was a Partick Thistle side looking low on confidence. Goals from Pat Clarke and Andy Kirk sealed the win in a game that the Jags never looked like winning. That said when they did breach a stalwart Pars defence they came up against goalkeeper Chris Smith who had an excellent game looking very safe and solid. On a lovely sunny but cool afternoon the Pars were playing towards the empty unused embankment with the healthy travelling support behind them. Willie Gibson was missing due to injury so the Pars lined up with the "usual" back four of Woods, Dowie. Higgins and McCann. 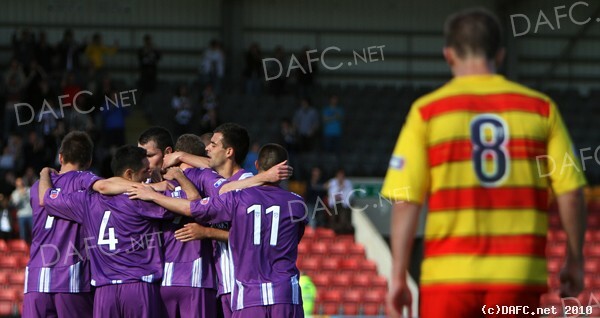 The midfield quartet was Willis, Mason, Bell and Cardle with Kirk and Clarke the strikers. The Pars were slow to start and found it difficult to get their passing game moving. 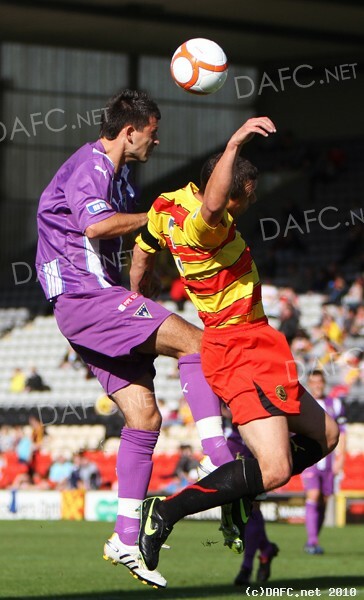 Indeed, Thistle managed to win a couple of quick corners which had to be defended. The Pars were as usual trying to get down both wings with Ozzie and Joe on the left with Woods on the right supported by Bell and Willis. It took until about 12 minutes before the Pars had a chance with a Kirk shot at goal. It continued to be quiet a scrappy game in those early stages with neither side able to instigate some composure. It was, therefore, a little out of the blue when the Pars took the lead with a terrific goal by Pat Clarke, he simply latched onto the ball just inside the Thistle half and he ran in a straight line towards Halliwell in the Thistle goal and he unleashed a rocket shot into the keepers top left corner from about 25 yards out. It was a stunning goal and one which immediately gave the team (and supporters)a lift. Thistle were struggling to create any serious openings although Smith was asked to make a great stop when Buchanan closed on him which seemed as if it would be a certain equaliser for Thistle but the keeper saved well. By this stage of the game the Pars were looking more dangerous when they moved forward. A great cross from the left by Cardle was missed as both strikers made the same run to the front post. Buchanan had another half chance just before half time but his shot was hit wide. Half time 0-1. No changes at half time for the Pars as they were now shooting towards their own fans. Again, another quick flurry by Thistle but Smith comfortably takes a couple of crosses. There is a persistency about this Pars side. Paul Willis was looking stronger on the right wing holding the ball up well as he looked for support. With the scoreline as slender as it was the next goal would be important. The Pars made a change McDougall replacing Pat Clarke in 70 minutes and it proved to be a significant change by Jim McIntyre. Almost with his first touch of the ball McDougall picked up a lovely pass from Joe cardle and the sub ran into the Thistle area evading two defenders to crash a shot off Halliwells right hand post and with the keeper standing at that side of his goal he could do nothing as Andy Kirk was closing in for the rebound which hit off him into the net. The relief among the players and fans was palpable. Notice too the goal celebration which was also in tribute to Steven Bell becoming a father. It was one of the best moves in the game and deserved the goal and one of those substitutions the manager will take some credit for! From there on in there was only one winner of this match. The Pars were still prompting and looking for an opening while Thistle started to look more desperate in their efforts and were sadly lacking in ideas. Chris Smith was called into action a few times to take crosses and he had one good save to make. Phinn came on for Willis in the last few minutes. Full time 0-2. Not a spectacular win but a vital win keeping the Pars at the top of the league. This is the sort of win championships are made of. The Pars clearly had the better of the exchanges and despite the loss of Willie Gibson the style of play was largely unaffected with Paul Willis having a good game on the right wing, if not quite as direct as Gibson. There is no doubt the inspired substitution with McDougall coming on turned the game and Stephen made a big difference. The defence did well with Dowie and Higgins coping with everything Thistle could throw at them and when the defence was stretched Chris Smith, the DAFC MOM, was there to stop the trouble. Chris had a great game and looked very secure, probably one of his best games yet for the Pars. Pat Clarke and Andy Kirk took their goals well with Pat`s in particular one to remember, a great finish. With good performances from the rest of the team there were no weak links in the Pars line up today.